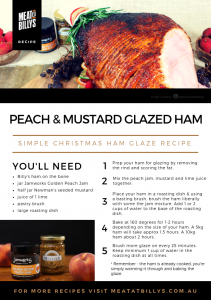 Glazing is a great option if you’d like to add a bit of extra flavour & theatre to your Christmas Ham. It’s quite easy to create a delicious glaze, especially if you follow this simple & delicious recipe for our Peach & Mustard Glazed Ham using locally sourced products. 1. Prep your ham for glazing by removing the rind and scoring the fat. 2. 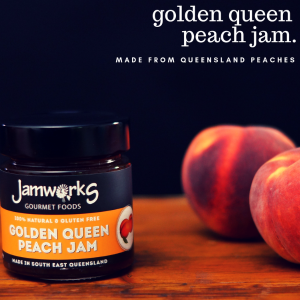 Mix the peach jam, mustard and lime juice together. 3. Place your ham in a roasting dish & using a basting brush, brush the ham liberally with some the jam mixture. Add 1 or 2 cups of water to the base of the roasting dish. 4. Bake at 160 degrees for 1-2 hours depending on the size of your ham. A 5kg ham will take approx 1.5 hours. A 10kg ham about 2 hours. 5. Brush more glaze on every 25 minutes. Keep minimum 1 cup of water in the roasting dish at all times. * Remember – the ham is already cooked, you’re simply warming it through and baking the glaze. DO I NEED TO COOK YOUR CHRISTMAS HAM? Our hams are already cooked, ready to eat when you purchase them. A ham on the bone is phenomonal served cold as is, but at Christmas time a lot of people love to glaze their ham and serve it hot. The process of glazing your ham merely warms the ham through and bakes on the glaze. It creates a lovely caramelised, darkened glaze over the fat on the top of your Christmas ham. HOW DO I PREPARE THE HAM FOR GLAZING? With a sharp knife, carefully make an incision through the rind around the hock. You can get creative here and make different patterns if you like. Gently press your fingertips underneath the rind at the front of the ham until you get a grip on the rind. Carefully peel the rind back away from the fat until fully removed. Score the fat with a sharp knife in the pattern of your choice. Take care when scoring to not cut right through the fat down to the ham.